in 1953 I was born in IJmuiden, the Netherlands. I started my studies at the Rietveld Academy in Amsterdam, but changed after a year to the part-time teacher training program in drawing in Haarlem. I am married to Aad van den Bos, pastor in the Protestant Church in the Netherlands. We have four children. In the rectory I started my studies in Cultural sciences at the Open University. With Amsterdam around the corner there was a lot of culture to take in. After ten years we moved to Hilversum where we live today. In the meantime we have been blessed with four grandchildren. In Hilversum I started to work professionally. My studio is in nearby Bussum. The last couple of years I work on a portfolio that aims at making visible the frailty of human existence. Contemporary people can be damaged by the extreme requirements that society imposes on them. Psychologically we can become mixed up through that and lose track. The pressure is severe and especially young people suffer from this. Through derailments in politics, economy or ecology disasters like floods can happen. At such times it becomes very clear how frail life is. Right now there are many reports of misery through floods that happen extremely often in the last couple of years in various parts of the world. In floods one completely loses control of life and security disappears. One is homeless. A flood exposes the frailty of life in a penetrating way. 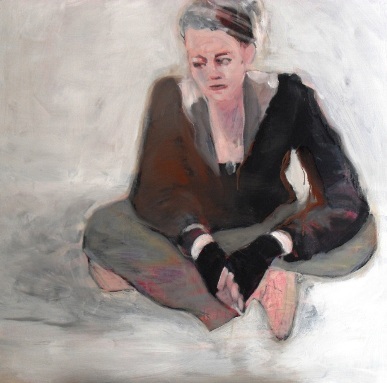 1.Charlotte, acrylics on canvas, 110 x 110 cm, 2009. 2. 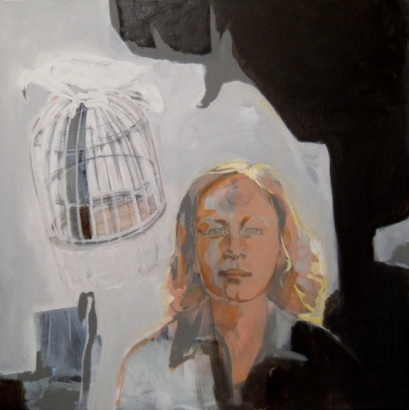 The Cage, acrylics on canvas, 100 x 100 cm, 2011. 3. The Flood-Chines Boy, acrylics on canvas, 150 x 150 cm, 2010. 4. No title, mixed media on canvas, 200 x 100 cm, 2011. 5. 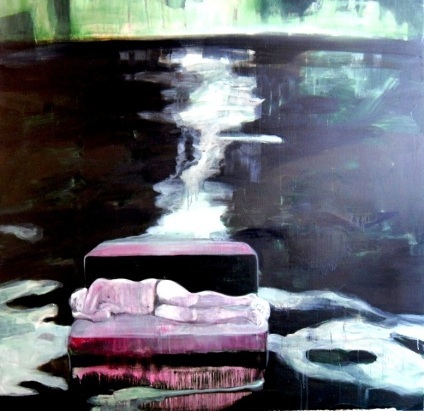 The Flood/Lifeline, oil on canvas, 160 x 50 cm, 2010.